The Economist Events hosted its third-annual Pride and Prejudice event to explore how united efforts among leaders in business, politics and society can improve the legal rights and societal treatment of LGBT people worldwide. 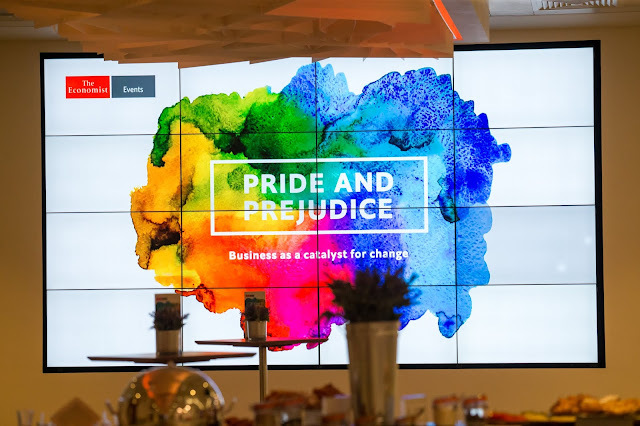 On May 24th, 2018, The Economist Events hosted the third edition of Pride and Prejudice, a 24-hour event hosted by The Economist Events across three cities – Hong Kong, London and New York. This year's summit focused on evaluating how governments, companies and individuals can turn the global conversation around lesbian, gay, bisexual and transgender (LGBT) diversity and inclusion into meaningful action through advocacy. "Human rights should come first, everything else should come after that. Corporations have a responsibility to take a stand and be a force for good," said Salesforce Chief Equality Officer Tony Prophet during Pride and Prejudice. "There's something powerful about making a public declaration, being someone's ally and using that as a higher purpose to direct your behaviors. You have to challenge people's moral compass. Are we standing on the right side of history or not?" Also speaking at the event, actor and activist Nico Tortorella shared his perspective as a leading man in Hollywood. Tortorella stated that "because of the way I look, the color of my skin and the [straight] character I play on television, I have the ability to have this conversation [about LGBT issues] in a way that's more digestible for people because of how people see me. That is my privilege. So it's a no-brainer for me—I have a responsibility that comes with that privilege to not only share my story, but to also share my platform with as many people as I possibly can." ⏩ During the event, The Economist Intelligence Unit also unveiled findings from a global survey of over 1,000 executives across 87 countries to assess different aspects of LGBT inclusion. The research focused on the evolving landscape for public LGBT advocacy, how the environment for it may change in the future and the obstacles that still stand in the way of progress. "We've come a long way, but we have a lot further to go as well. There are a lot of people who need to a little nudge to get the conversation going to realize how many allies they actually have. Unless they speak, you don't know that they're there. Don't be afraid to let your voice be heard. Otherwise, you are colluding in the abuse," urged Olympic athlete and LGBT activist Greg Louganis during the event. "Be a voice, be an advocate, and don't back away from standing up for what's right." ⏩ To access the full research report, please visit Pride and prejudice: the future of advocacy. The Economist Events brings the rigour of informed analysis and intelligent debate that The Economist is known for to life on stage in international forums. They host over 80 events annually in over 30 countries on topics that convene world-class thought leaders on a range of strategic business issues.